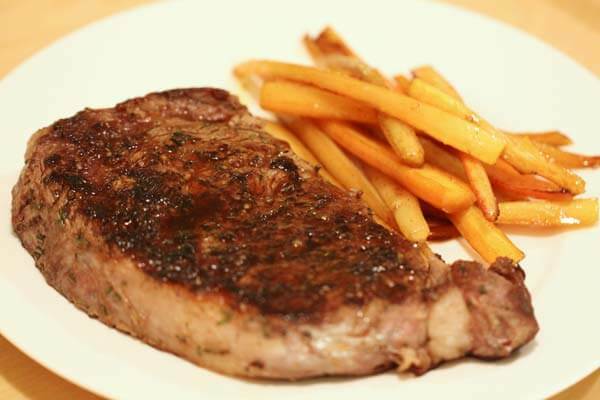 Ribeye steak is not a cheap cut, but it’s a very tender and flavourful cut. It lends itself well to pan-frying or grilling. 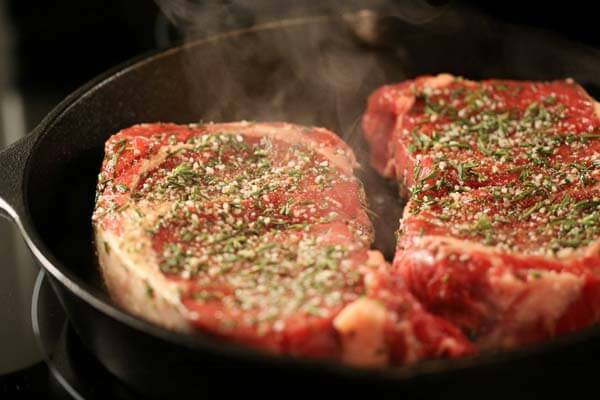 Make sure you get thick steaks… if they’re too thin, they’ll overcook and you’ll be disappointed. Aim for at least 1-inch thick steaks. The preparation I made involved a simple rub of ground anise, fresh rosemary, salt and pepper. I grilled them to medium-rare in a cast-iron pan. I served the steaks with pan-roasted carrots. These almost outshone the steaks… they’re a real keeper! Again, super-simple… start by browning them in a frying pan with some maple syrup, salt and pepper, then finish in the oven (but not overcooked… they should stay quite toothy). This meal comes together very easily. Start with the carrots, and once they’re in the oven, concentrate on cooking the steaks. Enjoy!